The name of Jim Carlisle, a talented singer/guitar player and harmonicist does not need to be introduced any more as he became a kind of semi-legend of his own. Jim Carlisle, born in Ireland, was first established in England in the late 70s and can be associated with the British Rockabilly revival movement. 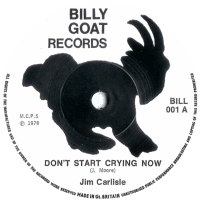 Around this time, his first recording on wax, a single released by the small English label BILLYGOAT, reached the top of the Rock & Roll Revival Charts in the UK. The record, a rockabilly rendition of Slim Harpo's 'Don't Start Crying Now' recorded at his home and all by himself using all instruments, found an immediate success and offered him appearances on the BBC. Looking back at those times, people realise that he was tremendously ahead of his time being so authentic.